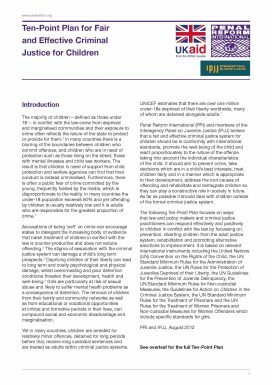 This 10-Point Plan focuses on ways that law and policy makers and criminal justice practitioners can respond effectively and positively to children in contact and in conflict with the law. The Plan is based on relevant international instruments including the United Nations (UN) Convention on the Rights of the Child, the UN Standard Minimum Rules for the Administration of Juvenile Justice and the UN Rules for the Protection of Juveniles Deprived of their Liberty. It is available in English, French, Russian, Spanish, Arabic and Turkish. A 10-Point Plan focusing on ways to reduce overcrowding in prisons across the world.